Sudhir Ruparelia(56) has been sealed as the richest Ugandan after owning half of Kampala's business district and the best hotels. 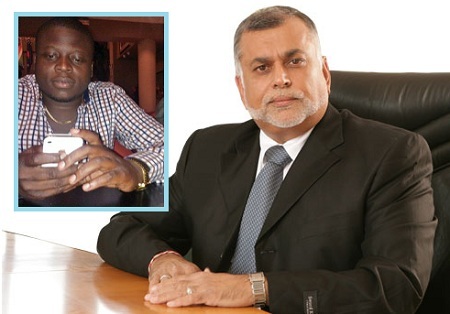 Some of Sudhir's assets include Speke Hotel, Kabira Country Club, Speke Resort Munyonyo and Crane Bank among others. In the list of top 40 richest Africans this year released by Forbes an American business magazine, Sudhir was ranked number 18 making him East Africa's richest and the only Ugandan on the list. Earlier on when Forbes was in the process of coming up with this list, five richest Ugandans were listed including Patrick Bitature, Charles Mbire, Amos Nzeyi and Armali Kharmali, but none of them made it to the top 40 list. In an effort to try and feature on that list like he did when the top five Ugandans were announced, Ivan Semwanga, a Ugandan based in South Africa tried to beat the queue by dashing to a casino where he wagered $34,000 but lost everything. After making one of the biggest and quickest losses of all time while in a Casino in South Africa, Ivan Semwanga simply went for dinner with his pals to try and forget about the loss.